The home enema kit is specifically designed with extra care to make an enema a delightful experience. Most importantly, the kit is accompanied by detailed enema instructions, the first ever of its kind. 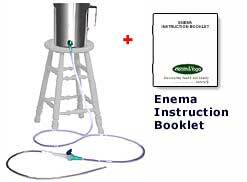 These instructions include EXTRA TIPS on how to do an enema for different conditions. It makes the whole process unbelievably EASY! Clinically hygienic  made of stainless steel. Unlike latex bags, it is very easy to clean and sterilize. Made of flexible and transparent plastic to make the liquid flow clearly visible. Extra length tips sterilized for safe and stress-free usage. Suggested for single use. Available individually or in packs of ten. Superior design of this plastic tap provides a better grip to the tap. Also includes a separate douche tube attachment. Stainless Steel Neti Pot withJalaneti Video CDROM Guide for Beginners, Children & Teachers. Miraculous herb for the skin. Also extremely effective in conditions of amoebic intestinal infections and Ulcerative colitis.